Samsung Electronics began preorders of its Galaxy S8 smartphone in India on Thursday, with the aim of reclaiming the top spot in the nation’s premium smartphone market. The Korean tech giant said it had begun preorders of its flagship smartphones, setting the price of the Galaxy S8 and Galaxy S8 Plus at 57,900 rupees ($895) and 64,900 rupees ($1,004), respectively. Its official launch will be on May 5. 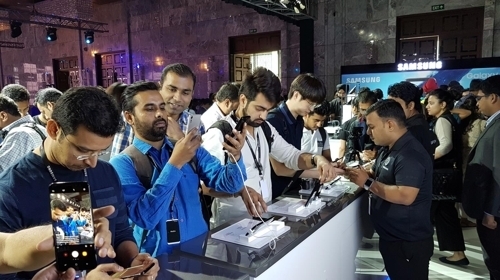 “In order to keep the promise of ‘production for India,’ we have made all the Galaxy S8 series sold here in India,” Hong Hyun-chil, the chief of Samsung’s Southwest Asian unit, told local reporters at a press conference in India. Samsung also said the Galaxy S8 would create synergy with its mobile payment service Samsung Pay, which was launched in India last month. On March 22, Samsung launched Samsung Pay in India in partnership with seven banks and card companies. Samsung is betting big on India, which has the world’s second-largest population and fast growth in the smartphone market. With smartphone penetration at around 30 percent, new demand for around 130 million units is expected to be created this year. In September last year, Samsung’s chief Lee Jae-yong met Prime Minister Narendra Modi in India and said said, “(Samsung) will make India a strategic base.” Samsung plans to invest 19.7 billion rupees in India over the next three years. In India’s premium smartphone market, Samsung Electronics, which had long retained the top spot, lost to Apple in the fourth quarter due to the discontinued sales of the fire-prone Galaxy Note 7. Samsung had a 35 percent share while Apple had a 62 percent share during the period. Apart from the premium phone segment, Samsung smartphones face fierce competition in India -- where gross domestic product per capita stands at $1,719 -- from budget phones made by Chinese handset makers. Xiaomi is recently emerging as a competitive rival in India, taking a 10 percent share of India’s total smartphone market in the fourth quarter. Samsung took first place with a 20 percent share, while Apple had an around 1 percent share. On the same day, Xiaomi launched its new premium phone Mi6 in China for around $400.